The Tyee’s Andrew MacLeod continues to write on issues important to our sector – one of the few BC journalists taking these issues on. Here he is in today’s Tyee writing about the stunning decision to use the $40 million Low Wage Redress Fund to benefit only unionized workers. In our sector, there are roughly 15,000 unionized workers and 17,000 non-union workers, the majority female. This decision is an unbelievably unfair blow to people whose wages have already been identified as too low, as it translates into a 14 per cent lift in wages for unionized workers while non-unionized ones get a scant two per cent. ‘It was about the unions closing the gap among their membership,’ says Shane Simpson. ‘That’s a collective bargaining matter that was there for the unions.’ Photo: BC Government Flickr. 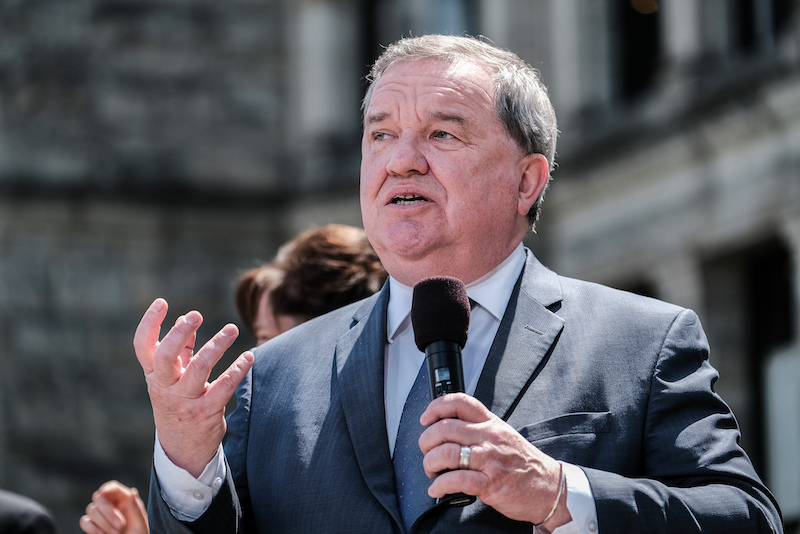 The BC Liberals say the NDP government is giving preferential treatment to unionized workers who provide some social services, while ignoring others who do the same work but aren’t in unions. On April 1, everyone in the sector got a two-per-cent raise. But the government also provided $40 million for “low wage redress.” The money was intended to bring the wages of union members working in community services closer to those of union members doing comparable work in the health sector. That’s been estimated to mean an extra 12-per-cent in pay for unionized workers. Non-union workers in community services were excluded from the wage redress program. Shane Simpson, the minister of social development and poverty reduction, says the pay differences emerged in bargaining with the unions. It will take time to work with all the groups involved to find solutions for a sector that was badly neglected by the former BC Liberal government, he said. BC Liberal Leader Andrew Wilkinson first raised the issue in the legislature on April 3. The topic has been central to four raucous question periods and opposition members say they still haven’t heard clear answers from the government. The government’s decision affects some 17,000 people, the majority of them women, who work for agencies that the government contracts to provide childcare, home support, addiction treatment, social housing and other services. For comparison, the unionized workers number nearly 15,000. By some accounts, some non-union workers will end up getting paid up to $4 less per hour than union members doing the same work. “In the past, with respect to social service agencies, when collective agreements were signed with the union workers in the sector to provide a raise, government would then fund the agencies to provide the same wage to their non-union employees,” Polak said. Simpson stressed that everyone across government will get a two-per-cent wage increase in each of the next three years and that he wasn’t involved in collective bargaining with the unions, which was handled through employer associations outside his ministry. But in closing one gap, the agreement created a new inequity between unionized and non-unionized workers. Brenda Gillette, head of the BC CEO Network, wrote Finance Minister Carole James in mid-March criticizing the government’s direction. “While we applaud the decision to address the recruitment and retention crisis in the community and social service sector over the next three years through the low wage redress, the decision to only address compensation for unionized employees will have widespread and damaging implications for the sector as a whole,” she wrote. The sector is already struggling, and the unequal funding will “lead to further destabilization of services for children, youth, families, people with intellectual disabilities, Indigenous peoples and communities,” she said. Tanya Behardien, the president of the Federation of Community Social Services of B.C., also wrote to James. “The lack of equitable distribution of wage increases compounds the recruitment and retention challenges that our member agencies already experience,” she wrote. In some cases agencies will end up with two classes of workers with different pay rates, Polak said. Or they may have to reduce services so that they can give the same raises to everyone, she said. Simpson said he’s heard the concerns from people in the sector and is committed to working with them on a solution. He would, however, rather have those conversations with the service providers than with the opposition in the legislature. “I want to talk about this seriously with the people it’s important to, and I don’t believe it’s important to the BC Liberals,” Simpson said. Adam Olsen, the BC Green Party MLA for Saanich North and the Islands, said people in the sector want to hear what the government plans to do, not about what happened during 16 years under the former government. The government could bring in a “fair wage policy” so that people doing the same work are paid the same amount, he said. This entry was posted in BC Politics, In the Media, Wage inequity on April 11, 2019 by Jody Paterson.